The following is the Decree approving the 1991 Rule and Constitutions of the Discalced Nuns of the Order of the Most Blessed Mary of Mount Carmel. Issued in Rome, 17 September 1991, on the Feast of Saint Albert of Jerusalem. “The Apostolic See, aware of the importance of the vocation of the Discalced Nuns of the Order of the Blessed Virgin Mary of Mount Carmel, has the duty to see to it that the spiritual riches of the teaching and the norms handed down by Holy Mother St. Teresa of Jesus be safeguarded, in conformity with the changed conditions of the times and the stipulations of current canonical legislation. For this reason, His Holiness John Paul II entrusted to this congregation for Institutes of Consecrated Life and Societies of Apostolic Life the task of overseeing the revision of the text of the Constitutions of the Discalced Carmelite Nuns, observing faithfully the principles of the Second Vatican Council and the Norms of the Code of Canon Law. At the conclusion of the revision work the text of the Rule and Constitutions was presented to the Holy Father on 3 August 1991. Issued in Rome, 17 September 1991, on the Feast of Saint Albert of Jerusalem. 1991 Constitutions of the Discalced Carmelite Nuns which our monastery follows. 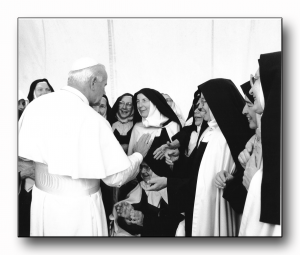 “To the Discalced Carmelite Nuns Upon the Approval of Their Fundamental Legislation. Now I address with affection, all the Discalced Carmelite Nuns on the occasion of the approval of a new text of Constitutions. Conscious of the great importance of your specific vocation, both for the family of Carmel and for the whole Church, the Holy See has submitted your legislation to a special discernment, in order to safeguard the spiritual heritage of Saint Teresa. Thus is brought to conclusion a long process by the Holy See. 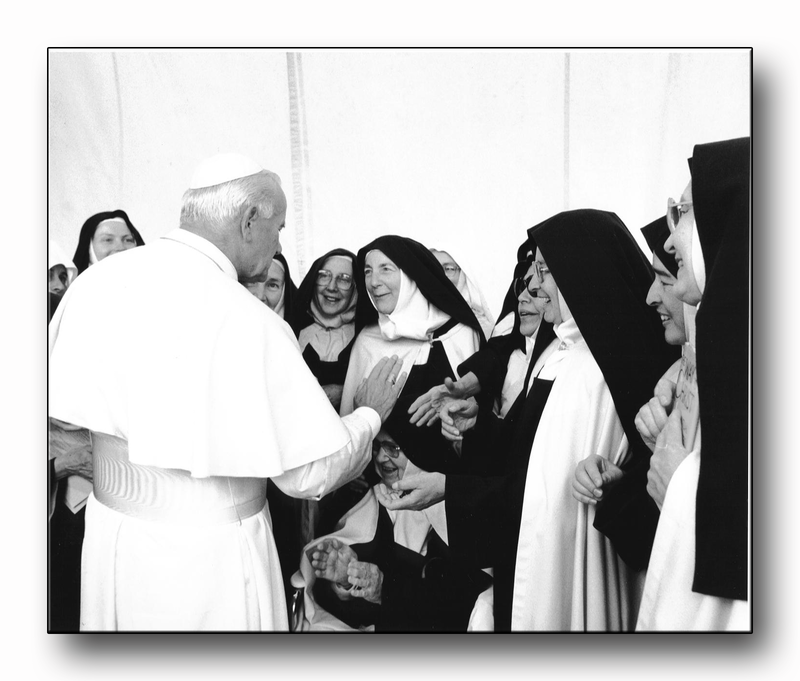 As is known, the Holy See, in replying to a petition of a group of monasteries, approved on 8 December 1990, a text of the Constitutions for the Discalced Carmelite Nuns. These were prepared according to the guidelines indicated in the Letter written in my name by the Cardinal Secretary of State, Agostino Casaroli, on 15 October 1984. These gave liberty to other monasteries of the Order who wanted to adopt them as a way of life. Taking into account the desires of the remaining monasteries, the same Holy See, has approved as well, another text of Constitutions for the Discalced Carmelite Nuns. The Congregation for the Institute of Consecrated Life and the Societies of Apostolic Life has prepared this text, taking into account the opinions of the monasteries, united under the Superior General of the Order. Both texts, equally approved by the Church, seek to be faithful interpretations of the Teresian charism. This remains unaltered, as well as the style of life proposed by the Holy Mother (St. Teresa) in her Constitutions and other writings. The differences do not refer therefore, either to the substance of the Teresian Carmelite contemplative charism, or to the necessary and constant return to the primitive inspiration. They correspond rather to the diverse modalities of interpreting adaptation to the changed conditions of the times, (cf. Perfectae caritatis no.2), and formulation of legislation for religious institutes, the approbation of which is the exclusive competence of the Holy See. We are dealing with different appreciations that are born from the same wish to be faithful to the Lord, which the Holy See has sought to respect. In the same way it respects the liberty of each monastery to opt for one or the other of the approved constitutional texts. In this particular moment of your history and legislation, permit me to manifest to you a desire that lies in the heart of the Father and Pastor of the universal Church. I desire that the approbation of the two texts of the Constitutions, by which I have tried to respond to the express desires of the different monasteries, keep alive the spiritual unity of all the Teresian Carmel, in the midst of its legitimate historical traditions, and the new circumstances, places and cultures, in which it embodies its charism.